5 Star Hotel Jobs in Dubai.The tourist industry has really taken off over the last few years in Dubai and the United Arab Emirates are now regarded as a top destination for holidaymakers from all over the world. Offering a wealth of fantastic attractions, world class shopping and beautiful weather, it is easy to see why Dubai is so popular. Some of the biggest and most expensive hotels in the world can be found in the city and some of the best chain hotels are represented here. Famous names like the Hyatt, Radisson and Hilton rub shoulders with exclusive resorts like the well known Burj Al Arab and The Palm. Anyone looking for an excellent source of employment in Dubai would do well to consider 5 star hotel jobs in Dubai. There are openings available within a wide range of sectors throughout the hospitality industry so experience and qualifications in a number of areas will stand you in good stead to secure a position at one of these top hotels. Which Types Of 5 Star Hotel Jobs In Dubai Are Available? Management - Manager Roles of different aspects of the hotel, including entertainment, public relations, human resources, conferences etc. Leisure services - Pool attendants, lifeguards, gym staff, entertainment staff, spa staff, beauticians, hairdressers. What Qualifications Are Necessary To Obtain Jobs In 5 Star Hotels In Dubai? The essential qualifications for staff can vary from post to post. Some roles will require specific qualifications within their field - such as chefs, accountants and beauticians, while others may rely more heavily on relevant experience within the industry. In general, for most positions you will require some previous experience in a similar role, especially those at a higher point on the pay scale; however there are some suitable entry level positions - especially within the housekeeping and service sectors. A good basic standard of education is a most for all roles, as well as good communication skills. Depending on the hotel and the role you are applying for there may be some special language requirements. Often at least a rudimentary knowledge of Arabic is required, especially for front of house posts such as reception work, as well as a reasonable fluency in English. Some other language skills would also be of benefit. In Dubai, it is permitted for employers to advertise posts to a specific group of people, so they may request that applicants for the role are within a certain age band or that they are exclusively male or female, so make sure to read any advert thoroughly before applying to make sure you fit the bill. 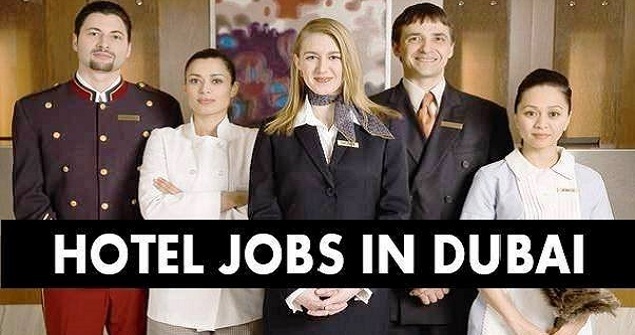 The internet is the best place to start your job search for hotel positions in Dubai. There are countless websites dedicated to listing hospitality industry jobs in the UAE and these are a quick and easy way to seek out appropriate roles which can be applied for online. Some hotel websites also advertise directly on their home pages for staff, so these should always be checked for current vacancies. There are also some recruitment agencies which specialize in supplying qualified hotel staff to the best hotels in Dubai. Register with one of these agencies and your CV will be distributed on your behalf to top hotels without you having to put in any extra effort.